First admire this dollhouse form the outside - with its elegant architecture and charm, it wouldn't look out of place in the fanciest neighborhoods (if it were bigger, of course.) Strong wood construction is covered by a delicate pink paint job with decorative columns, railings, and brickwork. Then open the hinged front walls to see that the inside is even more incredibly detailed - even down to the patterned wallpaper adorning the rooms. This dollhouse has six beautiful rooms, on three floors, and each is decorated with its own individual color scheme and furniture. 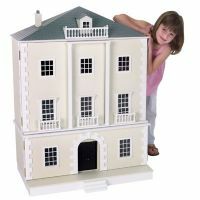 This dollhouse is ready for hours of imaginative play; just add a little girl!